Ford Motor Co. plans a major upgrade to its 2020 F-Series Super Duty truck line as competition in the heavy-duty pickup market heats up. Each of the major manufacturers has come out with redesigned models or announced significant improvements to their biggest pickup trucks in recent months. Ford will debut its Super Duty line with new engines, a new 10-speed automatic transmission and multiple technology enhancements at the 2019 Chicago Auto Show this week. The automaker said its improvements will make the Super Duty the most powerful model it has produced. The new engines include a 7.3-liter gasoline V8 and an upgraded third-generation 6.7-liter Power Stroke diesel V8. Both will be mated to the new heavy-duty transmission. Ford has yet to provide specifications for the new engines, but the torque and horsepower ratings are expected to be competitive with or even to top the 2020 Ram HD pickup unveiled at the North American International Auto Show in Detroit last month. 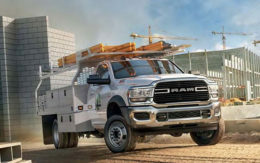 The Ram HD is the first heavy duty pickup to produce up to 1,000 pound-feet of torque, courtesy of a high-output Cummins turbo-diesel 6.7-liter engine rated at 400 horsepower. General Motors plans to pair a 10-speed Allison automatic transmission with its Duramax diesel engines in the 2020 Chevrolet Silverado HD, a combination expected to also have competitive power and torque ratings. Ford is clearly watching its rivals. “Regardless of what you may have heard of competitors in recent weeks, F-Series Super Duty continues to be the future of heavy-duty pickups. Between more power, more payload, improved towing and better technology, to improve productivity and help our customers build a better world,” said Kumar Galhotra, Ford president, North America. Ford is already pitching that rivals have to use either an engine or a transmission built by a supplier, noting that it is the only manufacturer to design and build all of its heavy-duty engines and transmissions. The new transmission replaces an older six-speed automatic. Although it has yet to release power ratings for the new engines, the 7.3-liter gasoline V8 will be the highest rated, most powerful Super Duty gas engine ever, said Dave Filipe, Ford’s vice president of global powertrain. It will slot between the truck line’s entry-level 6.2-liter V8 and the high-output diesel turbo engine. “We’re going to make it compatible so that it works well within an F-250 Super Duty all the way up to an F-750 Medium Duty,” Filipe said. The new diesel will be the third generation of Ford’s Power Stroke motor and the most powerful diesel engine produced for the Super Duty line, Filipe said. Typically, about two-thirds of Super Duty buyers opt for the diesel engine. “We’ve had to beef up the rest of the engine, upgrade our cylinder heads, upgrade our cylinder block, upgrade connecting rods and pistons,” Filipe said. Ford is making the improvements to maintain its position in the work truck market. While many of the heavy-duty pickups are purchased by consumers who tow boats and horse trailers or just want especially powerful trucks, the bread-and-butter of this market is vocational use. F-Series Super Duty had the most market share in 2018 in industries such as government, with more than 60 percent share; petroleum, with 50 percent share; and utility services, with more than 45 percent share, according to IHS Markit vehicle registration data. “If the power goes (out) where you live or your phone lines go down, it’s a very good bet that a Ford Super Duty will be on the scene carrying the crews and the equipment that’s needed to restore that service,” Galhotra said. Besides adding new powertrains, Ford is equipping the Super Duty line with the same type of driver-assistance features and convenience technology that’s available on its light vehicles. The bottom-of-the-line XL trim level will come standard with a 4G LTE modem that with a subscription can provide Wi-Fi access for up to 10 devices. It has the latest USB-C ports to charge phones and laptops. There’s a rearview camera and Ford’s SYNC infotainment system with a 4.2-inch screen, small compared with what’s going into lighter trucks and SUVs currently. Commercial users will get the Ford Telematics fleet-management system, which offers the ability to collect and monitor real-time data from their vehicles. Fleets, for example, can compare what type of fuel economy drivers achieve and monitor safety metrics, such as the number of hard-braking events. Other safety features, such as automatic emergency braking and a blind-spot alert system, are optional. The XLT and higher trim levels get standard automatic emergency braking, even for pedestrians. They will have a blind-spot alert system with coverage for trailers. There’s a lane-keeping alert for when the truck starts to drift. The high beams will automatically switch on and off depending on oncoming traffic. The SYNC system gets a larger, 8-inch, touchscreen. Ford also is providing other technology as options and occasionally standard equipment at the higher trim levels, mostly designed to make towing easier. These systems include Trailer Reverse Guidance, which uses a camera to show trailer angle and direction and provides steering suggestions to most efficiently direct a trailer backward. There’s also Pro Trailer Backup Assist, a knob that allows the driver to take their hands off the steering wheel to more easily guide the trailer via the reverse camera. Both systems are built to accommodate all trailer styles, including fifth-wheel and gooseneck trailers. Other features include adaptive cruise control and heating to prevent windshield wipers from freezing in cold conditions. Much of what Ford has done is add technology features to the Super Duty trucks that were not ready when they were first introduced in 2016, Peterson said. But the powertrain upgrades and other improvements should maintain Ford’s position as the top player is this segment of the truck market, he said. “The others are just getting up to where Ford was in 2016 with their 2020 heavy-duty pickups,” Peterson told Trucks.com. Still, Ram will make some inroads with its new HD line, he said. “It has a super interior, and that really helps sell a lot of trucks,” Peterson said. Ford’s trucks will be built at its factories in Louisville, Ky., and Avon Lake, Ohio, and go on sale late this year.